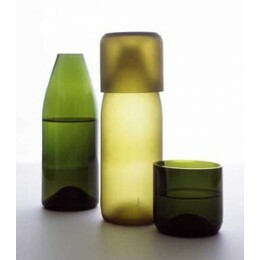 The tranSglass Carafe, with Sandlbasted Matte Finish is crafted from recycled bottles and conveys a positive attitude towards the environment. Recycled radiance takes on exciting new shapes and forms. Due to the recycled and handcrafted nature, products will vary slightly in size, appearance and color. Colors are pre-assorted in shades of green, clear and brown by the artisans only. Since its launch, tranSglass has become one of Artecnicas best-selling collections. With its recycled origins and sleek, fluid design, tranSglass conveys a positive attitude towards the environment. Artecnica collaborated with Guatemalan craftsmen to bring Emma Woffenden and Tord Boontjes designs to the market. Combining old-world craftsmanship and sophisticated design, each tranSglass vessel is a unique, one-of-a-kind piece. 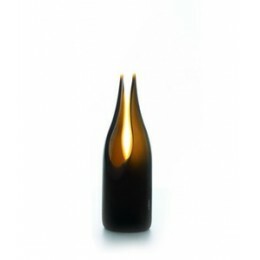 tranSglass is part of the permanent collection of MoMA New York. Handcut Vessel with Sandlbasted Matte Finish. Recycled radiance takes on exciting new shapes and forms. 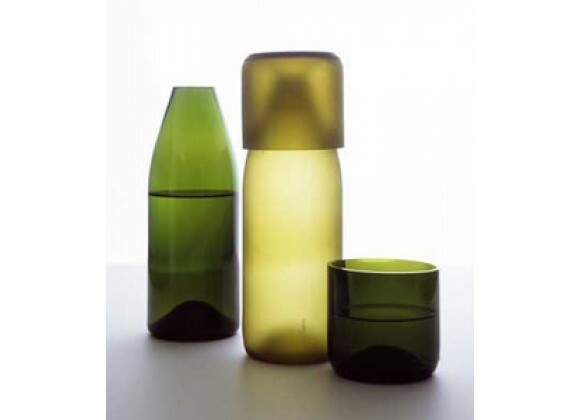 Due to its recycled and handcrafted nature, tranSglass vessels will vary slightly in size, appearance and color. Colors are pre-sorted in shades of green, clear and brown by the artisans only. tranSglass conveys a positive attitude towards the environment. Dimensions (inches) : Height: 8.5", Diameter 3.25"
Dimensions (inches) : Height: 8.5"